Is it good to put down the competition? In a word, yes, but there's more to it than that, as you'll soon discover. Over the years, many great challenger brands (Avis, Pepsi, VW, Dockers, Virgin Atlantic) have taken on the big brand leaders (Hertz, Coke, Ford, Haggar, British Airways) and they have all been very successful with this strategy. The reason for their success is clear. Even if the challenger brand doesn't have the money or power to go head to head in an ad campaign for a long period of time, it does have the ability to start a fight. And when the big brand accepts the challenge, the strategy pays off, big time. At the dawn of the sixties, when you wanted to rent a car you went to Hertz. It was a clear choice. Their main competitor, Avis, trailed far behind. At that time, Robert C. Townsend was the president of Avis. Their advertising agency was a shop that was gaining momentum with its track record of smart ads and strategic thinking - Doyle Dane Bernbach. During a meeting with the agency and its creative department, Townsend was grilled about the Avis business. He was asked the kinds of questions most agencies will ask: "Do you have better cars, or more locations, or cheaper rates?" The answer was no to all three, after all, Hertz was dominant in the field. But then Townsend said, "but we do try harder." DDB jumped on that and created one of the most powerful challenger brand campaigns ever produced. The ad "Avis Is Only No. 2; We Try Harder" (which became the tagline) was breakthrough, honest and had a fighting spirit. If there's one thing America loves, it's a hard-working underdog. It also painted a picture of Hertz as this uncaring, corporate behemoth, and Avis as the brave, plucky David taking on the slow, cumbersome Goliath. It worked. It really worked. In 1962, Avis was not making a profit and had just 11% of the market share. One year after the ad campaign launched, Avis was profitable. By 1966, Avis had 35% of the market. Perhaps the most famous brand battle of the last century is Coke against Pepsi, also know as "The Cola Wars." It's still going on to this very day, and neither side will ever let their guard down. They can't afford to. But it wasn't always a battle of giants. Coca-Cola hit the marketplace 12 years before Pepsi when drugstore owner (and morphine addict) John Pemberton launched his cocaine-infused drink in 1886. At that time, it was medicinal and was a supposed cure for morphine addiction, dyspepsia (the Pepsi connection) and headaches. In 1898, Pepsi was launched by Caleb Bradham, although it was originally called Brad's Drink. The name changed to Pepsi-Cola in 1903, but by then Coca-Cola already had a huge grasp of the market, selling over a million gallons per year. In 1915, Coke's famous contour bottle launched, further establishing the dominance of the brand. By 1945, Coke has a market share of 60%. But Pepsi started to eat away at that number. In 1975, the Pepsi Challenge came along. Pepsi took the idea of a challenger brand to the general public. 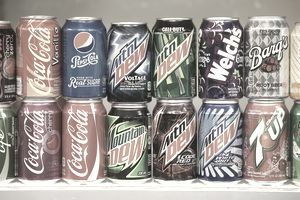 Blind taste tests were televised as ads, featuring people sipping two colas and deciding which they liked better. Pepsi beat out Coke, an embarrassing loss for the giant. That, coupled with the declining store sales (the market share was just 23% in 1983) led to one of the biggest mistakes in the history of the company. In 1985, New Coke was launched. It's said that on that day, everyone in Pepsi was given the day off. They had won the Cola War. Coke had spent millions formulating a new flavor just to compete with Pepsi's taste, and it proved to be a disaster. It was scrapped less than 3 months later, and Coke Classic went on the shelves. By then, Pepsi had seen Coke dish out millions and millions of wasted dollars, and it had upset a loyal customer base. These days, Coke has the larger market share (approx. 25% more) but spends twice as much on advertising per year than Pepsi. And Pepsi's revenue is much larger due to multiple business lines. Pepsi is no longer a challenger; it's an equal. "We're going to sell a German car, commissioned by Adolf Hitler, to America." "The car is small. Really small. And right now, Americans love big cars." Boom. The last semblance of hope flies out of the window. Well, not for Bill Bernbach. And not only did he succeed, but he also created an advertising campaign that changed the face of the industry and is regarded as one of the best campaigns of all time. The power of a challenger brand is that is can undermine the power and popularity of the status quo. Big cars are the norm. Everyone loves them. Big is beautiful. Doyle Dane Bernbach twisted that on its head. No, small is beautiful. It's cheaper. It's fuel efficient. It's extremely well-built. It's easier to park. It's reliable. Those two words, coupled with Helmut Krone's beautifully simple layout, cut through the clutter. They made sense to the American public. The copy was witty, irreverent and honest. It was followed by one of the bravest ads ever produced; an image of a Volkswagen Beetle with the word "Lemon," a phrase to describe a shoddy car. The ads of the time were boastful. They wouldn't even hint at anything that was negative. But the ad was intriguing. When the consumer read more, they realized that car was one in a million. It was actually an ad about Volkswagen's high standards. And how honest? The tagline "We pluck the lemons; you get the plums" sealed the deal. The US auto industry didn't know what to make of them. At first, they were considered a joke. Then an annoyance. Then a competitor. Then a real threat. By 1972, just over 12 years later, the Volkswagen Beetle had gone from a virtually unknown car to the most popular car ever made (overtaking the Ford "Model T"). That's the power of advertising, and no matter how hard the other automakers tried to put it down, it only fueled the Beetle's fire.